Over the past year, I have had several clients comment that "there is nothing like a spectacular cake to make a party really special". I firmly believe that a cake that either matches the theme of the party, or that is specifically customized to honor the cake's recipient really makes the party sing and makes that person feel especially honored. The project that I completed this past week is a perfect example of "custom". It was for a Sweet 16 PJ party and all the details were created to incorporate the birthday girl's interests and favorite things. The idea was to have cupcakes for the party and coordinating cakepops to add to the candy bar that Mom was planning and also send home as favors. Teal and lime green were requested as well as a nod to the facts that her daughter plays field hockey at Monacan HS and LOVES Taylor Swift. She also wanted 1/2 to be Red Velvet and 1/2 White Almond cake. I had lots of fun details with which to work. This photo represents a sample of what I produced. This was actually an order of 3 dozen cupcakes and 3 dozen cakepops - so this gaggle of girls had LOTS of sweets to enjoy! The Mom commented after the party that the 9 girls in attendance had finished off all 36 cakepops by the time morning came! I would say that spells success! The day after this delivery ended up being a rainy Saturday with absolutely nothing on the to-do list. So what did I do? I baked. I must be addicted! But, I had some other things that I wanted to play with that were not business-related. The first was for my cooking club. The theme this month was "make your favorite restaurant" dish. My first thought was an amazing shrimp and grits that I had at Tupelo Honey Cafe in Asheviile, NC, but I had already done that dish in a previous month. So, I opted for my favorite chips and salsa. I know, it sounds boring. But it is anything but! Pescado's (an amazing local place featuring fresh seafood, local greens and a sassy Latin twist on all the dishes) serves chips that I will simply say are covered in crack. I mean, these things are so addictive. The secret is that they are sprinkled with the most subtle taste of sugar and served with a spicy, but fruity salsa. SO delish! So, I made those with a Strawberry Salsa and while they weren't as good as Pescado's, I still had trouble saying no. Then on to the baking. One of my favorite treats is Starbuck's Pumpkin Scone. They are dangerous and I try to only have a couple per year. They are seasonal offering, which for my waistline, is a really good thing. But, dang! I am in trouble now...because I found a recipe for them that is even better than the original! I can't afford to have these in my grasp whenever I want them! I mean, they turned out great! So, I packed them in a little brown bag and took them as take-out treats for the girls to enjoy the next morning. After that, I had to make something for the boys. As you can imagine, when I am in the kitchen, they are periodically peeking in to see what might be falling on the floor (kidding). I had seen a cute Ninjago cupcake on Pinterest and decided to whip up a couple for the boys. They, like most 7 year old boys, are addicted to all things LEGO, so these were a big hit! Call me if you need a little something "custom" for your next party! Last week had me working on another birthday cake for a sweet neighborhood boy named Jack. Jack is the same age as my boys and we have known his family since moving in 5 years ago. His brother was the recipient of the "Batman cake" from last May, so Jack asked for the cake lady to make his as well. I think I am gaining a following from the kiddos! Jack's party was at a local sports complex called Windy Hill. They have go-carts, golf, baseball..all the makings for an all-around fun day! Jack was the most excited about the go-carts, so that became the focus of the cake. I made crowd-favorite White Almond Sour Cream cake topped with Vanilla Buttercream and fondant decorations. I am already at work thinking about his brother's LEGO cake, due in May! Also on the agenda for week before last were sweets for the birthday celebration of darling Sadie. Sadie is the adorable 2 year old of my son's former Kindergarten teacher. She was having a garden themed party and her Mom asked for cupcakes for the kids and a small cake for the adults. We decided on brightly colored flowers on the cupcakes and cake, and I added a white picket fence and fondant watering can to complete the scene. Mom laid them out on a bed of grass and they looked scrumptious! Thank you, Mrs. Reynolds! On another note, a few months ago, my cooking club met here at my house. We get together every month, rotating houses, and each cook a dish/dishes to match the theme that the host has chosen. I have to say that I love these girls and boy can they cook. We have had some amazing dishes over the years and I always look forward to learning something new from them, not only about cooking, but about life stuff in general. Everything was absolutely delicious, as usual. This month, we are recreating our favorite take out dishes. Can't wait!! Another very busy week around here, with two celebration cakes on the calendar for the same weekend. But it's the kind of busy that I just love! A dear friend and great client asked me to make a cake for a baby shower celebrating the arrival of her very first grandchild. I have been hoping for the opportunity to do a baby shower cake and I loved the challenge that this project afforded me. The Grandmom-to-be lives here in Virginia, where the shower took place. However, the Mom-to-be lives in New York and loved the cakes made by a NY area bakery, Pink Cake Box. They have become very well known for their "pregnant lady cakes" and the Mom sent several links to designs that she liked. Well, needless to say, I had not yet made a person out of fondant or gumpaste, much less a beautiful, glowing pregnant lady. I was nervous, but excited to test my skills with the re-creation of one of their highly desired designs. 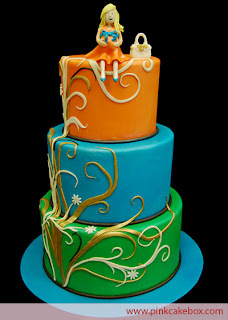 In addition, the cake that she liked was fully covered and detailed in fondant, which I had not done alot of thus far. Most of my cakes are buttercream or cream cheese, so I was also excited to fine tune some of those fondant skills as well. Here is a picture of the Pink Cake Box cake (blog.pinkcakebox.com) that she liked the best. My client is expecting a girl and requested that I soften the colors on her cake with a palette of pinky mauve, brown, cream and champagne. I have to admit that I now completely understand why so many pastry artists love working with fondant. It really is such fun to work with and provides a very professional, finished result. I had a blast building this cake and am so grateful that the challenge paid off for me. I am beyond happy with the result and can't wait to do more of these! If you are expecting or know if anyone in the area who is, please send them my way. I would love to make a special cake for their shower, or even just the topper for their own cake. I can customize skin color, hair color and style and dress/accessories colors to make the cake personalized just for the Mom-to-be.